1. SGR - the game changer - Did you know that dustbowl will have a whopping 4 SGR passenger stations? This is by far the highest number of stations in any single county. Let me explain how. Ngong and Rongai will be the two main ones. Athi River station, while technically in Machakos, virtually borders Kitengela town, the dustbowl jewel in the crown (in fact IMHO they should have renamed it Kitengela station as the bulk of the traffic will be destined there), so it might as well be a dustbowl station. Emali straddles Both Makueni and dustbowl county so it is "ours" as well. 3. Almost all the fastest growing towns in Kenya are in dustbowl. Kitengela, Emali, Rongai, Kiserian and Ngong. Rongai alone will be a city in itself within 10 years IMHO. Imagine what impact all those population inflows will have on real estate/land prices in general in the coming 30 years. 4. Dustbowl is the only gateway to Tanzania from Nairobi. This is a strategic advantage that cannot be ignored. SGR of the future (probably phase 3A) to Arusha will have to pass through dustbowl. Tanzania are already building theirs. By 2030 our SGRs and theirs will probably be linked, thanks to the East Africa Railway Development Master plan. Dustbowl will derive huge benefits from this new corridor. 5. Dustbowl is the gateway to several world famous national parks. Amboseli, Kilimanjaro, Chyulu Hills, Part of Tsavo, Serengeti, NgoroNgoro (a world wonder). It also hosts Shompole conservancy, Ngong Hills National Reserve, Lake Amboseli, Lake Chala, access to Lake Natron and Lake Magadi - a unique one of a kind lake in this part of the world. Tourist potential galore that is not even 1% exploited fully yet! 7. Dustbowl has rich untapped agricultural potential as long as there is water supply. Virgin land all over the place. With water all things are possible. 8. Dustbowl has the cheapest land for the most potential all things being equal IMHO. Everyone may love to buy ten acres in Limuru but that could get you hundreds if not thousands of acres in dustbowl for the same price. And Limuru is already well developed so you are paying at the top of the market rather than getting in at the ground floor. Moral of the story; dustbowl is the future.Invest now or forever gnash teeth in bitter regret when you read this thread again 15 years from now (in 2033). Ni hayo maoni yangu tu. I am yet to use the SGR. What is the economic effect in the towns already covered areas between Mombasa and Nairobi? For #6,add limestone..and BTW which sort of vehicle do you recommend for touring these dustbowl areas? Such a well written piece @Mugunda.And yes Yuko.kajiado as per OLX 130k for 50by 100. Indeed @ limestone. 4x4 ni lazima for dustbowl jameni. I did Isinya -Konza some months back and that road sio mjezo,I hope they tarmack it soonest. Once tarmacked that whole area will boom ile mbaya. Thanks Kate. Yes indeed. 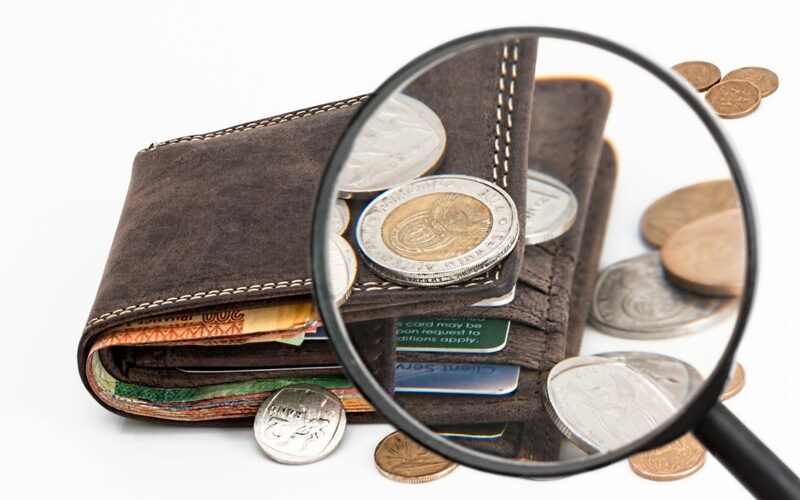 Bargains galore that are rare to find anywhere else. But not for long! How were you regretting owning such a precious asset, and with clean title too? I am not selling anything I have in dustbowl for at least the next 25 years if, God willing, I live that long! I bought that plot in 2015 assuming Optiven would develop it (sink boreholes, bring electricity, do the internal murram roads etc) by end of 2017. They are doing it but at a very slow pace. So naturally I was starting to regret early this year. Now I'm beginning to think I made the right move. 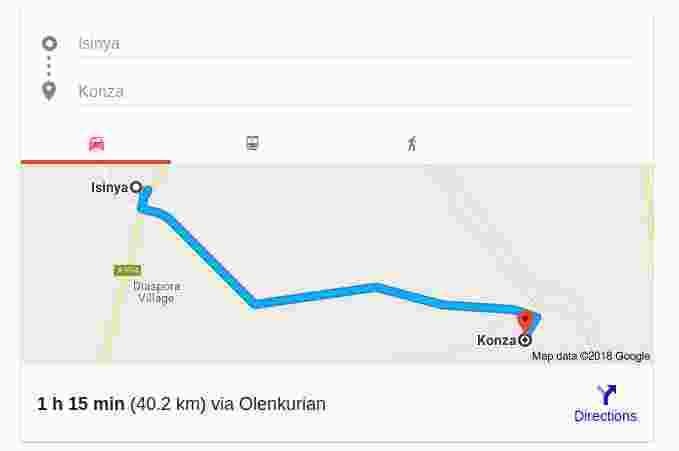 How long is that Isinya/Konza road approximately? According to google, approx 40km. I am not sure if the road was regraded after the last long rains. It was long overdue for regrading. My favourite stretch on this road is near Enchaipai (sp?) Resort where the white murram road connects with the horizon in the distance and the terrain is nywee and you can spot an odd animal or two hopping around.And birds everywhere. Kenya is a beautiful country to drive around, as long as the murram is regularly graded to make the ride smooth enough. I hear you bro. In my experience in this business in our beautiful country, patience is golden. I have bought land in some scary places, got title and forgotten about it. A year later I revisit the place and I'm having trouble finding the plot because so many new developments have come up around it that the place looks completely different! Hitches and glitches are always there in service provision (eg delays in getting title or borehole delivery as you mention) but if you are with a good company like Optiven and others, they always deliver in the long run. Congrats to her! While others cry they will never buy a plot in their life..shauri yao! Kajiado County has experienced considerable growth in the last five years. Major developments in the area have attracted a lot of investors. For instance, the Standard Gauge Railway passes through Kajiado County. Such development has further brightened the prospects of this cosmopolitan county stirring economic growth. The overflow of the population in Nairobi City has pushed people south in search of better and affordable housing. It has resulted to the property boom in major towns of Kajiado County such as Kitengela, Ongata Rongai and Ngong. This grand investment opportunity is bound to yield good returns. This is the best time to purchase land as the prices are still low. In addition, Kajiado has good roads and a railway line. Close proximity to Nairobi makes it even more attractive. It’s also close to Tanzania through the Namanga border making it viable for robust regional trade. Kajiado has extensive land for industrial and manufacturing plants. Ready and affordable workforce exists and also easy access to raw materials. The Government recently set up a cement clinker plant within the county. Other up and running manufacturers include Magadi Soda in Magadi and Steel Melting Plant in Isinya. As pastoralists, Kajiado people have been traditional livestock farmers throughout history. The county government has enhanced this by constructing a modern export slaughterhouse at Imbirikani to cater for meat production in Kajiado and its environs. There is also a leather tannery at Isinya and livestock yard sales in many areas. Livestock farming is a lucrative business in Kajiado. In addition, the county has arable land suitable for domestic and commercial farming. Locals are embracing farming for sustainable and consistent food production to cater for the residents in the area. Great potential exists for investors in large-scale farming. The county government has prioritized sinking of boreholes to develop irrigation. It has also put in place measures to protect farmers in the packaging of different farm produce. County of Kajiado infrastructure is developing at an exponential rate. It has the standard Gauge Railway running through it as well as Nairobi-Namanga highway. Nevertheless, there is still great potential for contractors to build a wider network of roads connecting various towns and neighboring counties. Moreover, Kajiado is in dire need of surface water. Sinking boreholes and providing a reliable water supply is necessary. In the advancement of technology in the county, there is need for internet and broadband providers to serve the growing population and industries. Kajiado County will be home to SGR stations in Ngong and Ongata Rongai along the new railway line running from Nairobi to Naivasha. This will spark growth in business in the respective towns as well as surrounding areas. Potential businesses include restaurants, banks, clothes and farm produce markets. Electricity connection has spread out significantly in the county improving business operations. 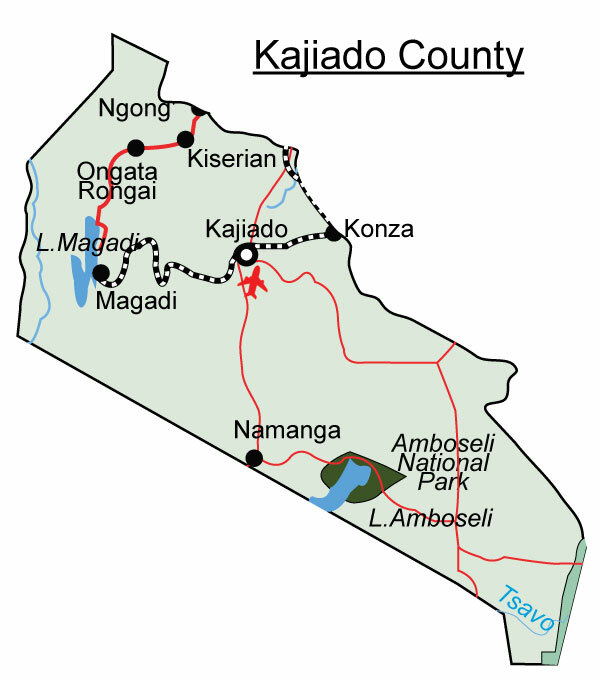 The County of Kajiado is easily accessible due to good roads. Major roads such as Nairobi–Namanga highway play a key role in the transport industry. Another road is the recently constructed 70km road running through Imaroro, Mashuu and Isara set to go all the way to Suswa. Investing in transport is a prime business. Kajiado County has great potential. Unlike other counties like Nairobi it’s not overexploited. Its close proximity to the capital city makes it even more appealing and worthwhile. Kajiado has also appeared in lists of the richest counties in Kenya numerous times. This clearly shows the lucrative prospects of the county. Residents of Kitengela town will start enjoying commuter train services in the next one year. Transport and Infrastructure principal secretary Charles Hinga said the Cabinet approved the Kitengela modern railway station two weeks ago to ease commuters’ agony and boost trade in the populous town. “Once the modern railway station is complete, Kitengela residents will be served by a commuter train to Nairobi after every 30 minutes, a move we expect to open up the town for more business opportunities,” Mr Hinga said. Motorists will also leave their cars at the parking lot and board the train to Nairobi. On average, 300,000 people are known to commute daily between Kitengela and Nairobi for work or business. I told folks that Kenya's third richest county is the future and they did not take me seriously. Ngoja tu, we have not even scraped the surface of the superboom to come in DC. Jewel in the crown (Kitengela) is coming up like blazes. Have you guys been inside the new mall? Haiyaauuu! Ive been in Two Rivers, the Hub and many others yet Kitengela Mall brings the heat to all of them. Sample this lady's visit hapa for more. Toured Ngong juzi..5 sparkling new petrol stations have been built near Ngong CBD in less than 3 months! Those big companies do not build bila research. Meanwhile central gava is building serious roads in and around Ngong bus park at the core of the CBD. Meanwhile modern apartment complexes and high rise buildings are coming up like crazy! At Embulbul SGR is becoming more and more visible each day. The station at Kangawa is coming up lovely. Kajiado county roads..hizoooo...coming up very fast! Prices in dustbowl county hizooo..juu juu zaidi each day. And the big open secret for those who have not shikad radar by now..DC is ground zero of Big Four push! What more do people want to be told? And DC is just getting started! Tupe time. The wise ones have already invested there. Wenye kuzubaa waendelee tu kuzubaa..that is their right! A ride around Ngong town; shows Kibiku, areas closer to Ngong CBD eg Zambia, Kerarapon Ngong and more. Kitengela may be the dustbowl jewel in the crown but what I love about Ngong is that it is greener and more scenic with its hills. Did you know that Ngong is the only really hilly area close to Nairobi? That should make it the Hollywood Hills of Nairobi if we do not mess things up with poor planning. As I have said many times before Ngong is punching way below its weight as a town. With a few tweaks even Kite cannot come close. I also love that Ngong still has very many vacant plots ripe for development compared to Kitengela core, and it is more of a residential town although that is changing fast as businesses move in to cater to the swelling middle classes. I also love that Ngong is closer and easier to access than Kitengela. Once Ngong road expansion is done, Ngong will be a less than 15 minute drive away from CBD! Pedestrian walkway is a new vocaburaly in DC. I like how you market DC. Deliberately choosing what to show case. Why don't you post the "alternative dustbowl" you want to showcase if this one irks you? Why do you think we are investing in DC? Ama you thought D-bowl was just acacia trees and goats? Dustbowl is THE FUTURE of Kiinya my broda. You can take that to the bank and cash it in clean, crispy notes!